I noticed something at the Sendai station that I had not seen before: the walls of the tracks are adorned by various plaques. 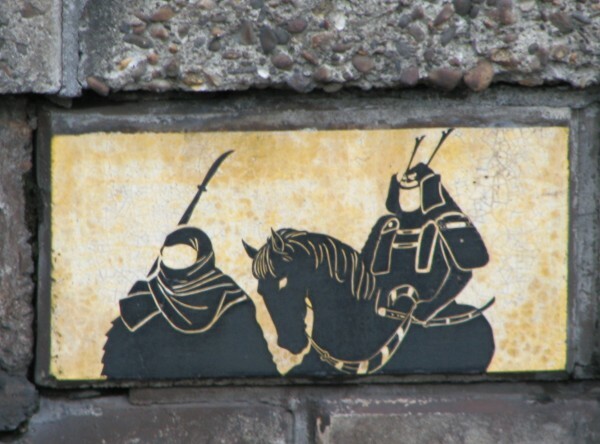 Some show a silhouette of Date Masamune, the great lord of Sendai. But some, to my delight, show Yoshitsune and his faithful Benkei! Yoshitsune is my favorite Japanese historical character. He was wonderfully depicted in the NHK taiga drama of the same name. He is of course associated with Hiraizumi, as he lived there several years before joining his brother Yoritomo and serving him as a great general. 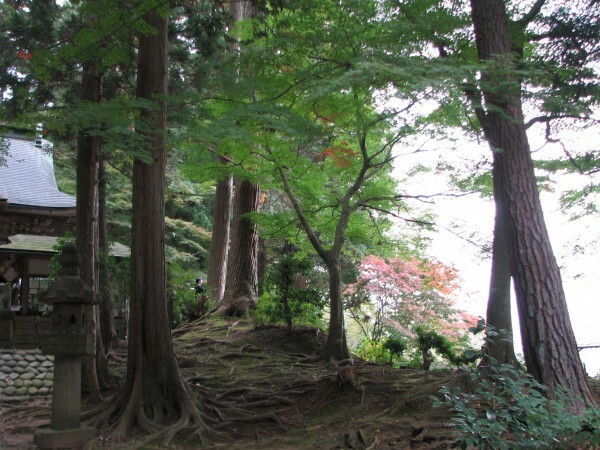 When he and his brother fell out, he took refuge in Hiraizumi, where the Fujiwara lord protected him. But the last battle there was lost, Yoshitsune died, and Yoritomo destroyed the city. It is now a peaceful small town, but with charm and a few reminders of its former glory. 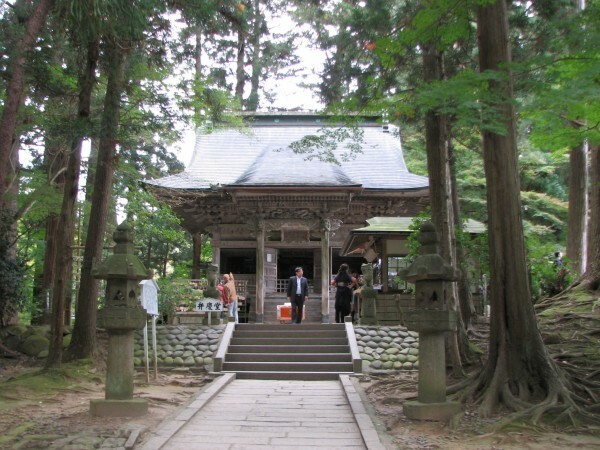 There is a shrine to Yoshitsune built by Date Musumane, but I didn't go there this time, having spent time there before. I didn't go either this time to Môtsû-ji. A few buildings do survive from this Heian temple, but it is best known for its wonderful "pure land" garden. I had spent some hours there on my first visit. But this time I dedicated myself to Benkei and Chûson-ji. This is a vast park with a few interesting suviving buildings. 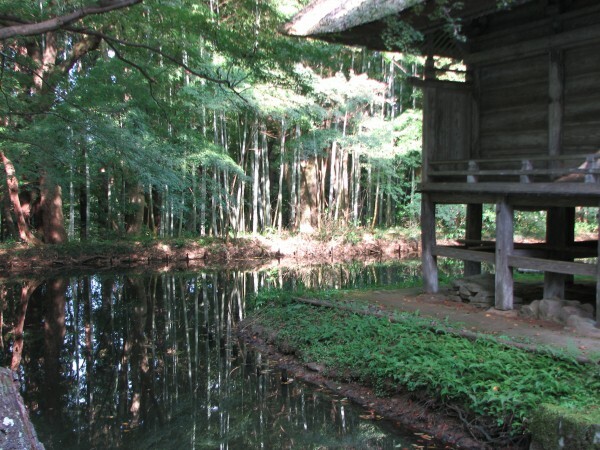 The most impressive is the Konjiki-do, which houses the remains of the Fujiwara lords. It is made of wood covered in gold and adorned with mother of pearl. Naturally you are not allowed to take pictures! It is really quite splendid. 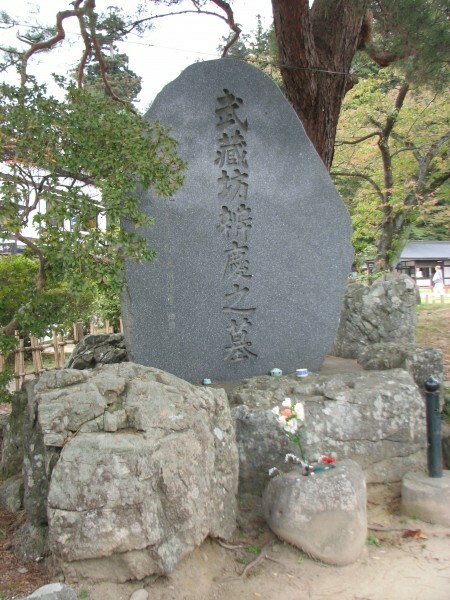 Near the entrance to Chûson-ji is Benkei's tomb. In case you are uncertain about Benkei, he was a tall and fierce "warrior monk" who served Yoshitsune loyally from the start, and stayed by his side to the end. He is quite famous.There were a very few small offerings. It is near the bus stop and a fairly busy road, not ideal. By the way, there is a vey convenient loop bus in Hiraizumi, stating from the station, which goes to all the interesting sites. Then you walk over to the main entrance, and it is a lovely 15/20 minutes walk to the temple. Along the way, you can see Benkei's shrine, where quite a few people were paying their respects. It is quite small, actually. I rather liked the setting and the pattern of stones. Here is the view to the side of it, with a faintly colored little maple. A little further along is this small structure. I only photographed it because I liked the tiny moat and the bamboo forest behind it. 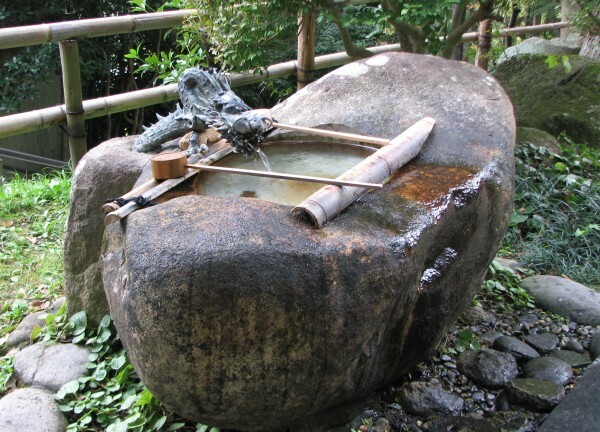 I am very fond of older Japanese fountains, and particularly like this enormous old stone and the dragon spout. The forest there is one of its attractions, though I should mention also some nice view points on the city and the countryside, thanks to the elevation. It was very chilly in Hiraizumi, and I was happy I had brought gloves and a cap. The next day I went to Matsushima, which I expected to be cold as well, and it turned out to be balmy, for which I was most grateful. I will speak of Matsushima in my next post. I hope you come read it!